Mozart stands for culture and thereby has come to represent the aspirations of a middle class for whom Kultur has been commodified. Since the industrialization of the nineteenth century, mass-produced cultural goods—packaged in the canon—have become a capitalist value. The cultural icon has become a market force to be reckoned with. 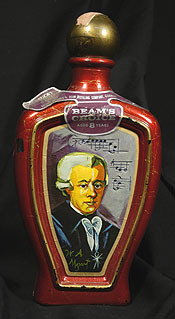 Kentucky Straight Bourbon Whiskey – Special Edition Mozart Bottle, Portrait by Edward H. Weiss (WT).